Mayon (Central Bicolano: Bulkan Mayon, Tagalog: Bulkang Mayon, Spanish: Monte Mayón), also known as Mayon Volcano or Mount Mayon, is a sacred and active stratovolcano in the province of Albay in Bicol Region, on the large island of Luzon in the Philippines. Renowned as the "perfect cone" because of its symmetric conical shape, the volcano with its surrounding landscape was declared a national park on July 20, 1938, the first in the nation. It was reclassified a Natural Park and renamed as the Mayon Volcano Natural Park in 2000. It is said that the volcano grew from the burial grounds of lovers Magayon and Pangaronon. Thus, the ancient Bicolanos named it after the legendary princess-heroine Daragang Magayon (English: Beautiful Lady). After some time, the volcano was chosen as the abode of the supreme god of the Bicolano people, Gugurang, who also chose Mayon as the repository of the sacred fire of Ibalon. Numerous festivals and rituals are associated with the volcano and its landscape. The volcano is the centerpiece of the Albay Biosphere Reserve, declared by UNESCO in 2016, and is currently being nominated as a World Heritage Site. Mayon is the main landmark and highest point of the province of Albay and the whole Bicol Region in the Philippines, rising 2,462 metres (8,077 ft) from the shores of the Albay Gulf about 10 kilometres (6.2 mi) away. 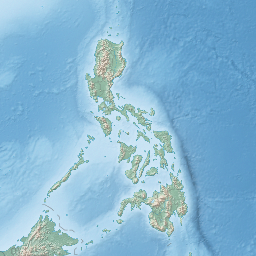 The volcano is geographically shared by the eight cities and municipalities of Legazpi City, Daraga, Camalig, Guinobatan, Ligao City, Tabaco City, Malilipot and Santo Domingo (clockwise from Legazpi), which divide the cone like slices of a pie when viewing a map of their political boundaries. The most destructive eruption of Mayon occurred on February 1, 1814 (VEI=4). Lava flowed but less than the 1766 eruption. The volcano belched dark ash and eventually bombarded the town of Cagsawa with tephra that buried it. Trees burned, and rivers were certainly damaged. Proximate areas were also devastated by the eruption, with ash accumulating to in depth. In Cagsawa, 1,200 locals perished in what is considered to be the most lethal eruption in Mayon's history according to PHIVOLCS. The eruption is believed to have contributed to the accumulation of atmospheric ash together with the catastrophic 1815 eruption of other volcanoes like Indonesia's Mount Tambora, leading to the Year Without a Summer in 1816. Mayon's longest uninterrupted eruption occurred on June 23, 1897 (VEI=4), which rained fire for seven days. Lava once again flowed down to civilization. Eleven kilometers (7 miles) eastward, the village of Bacacay was buried 15 m (49 ft) beneath the lava. In Santo Domingo 100 people were killed by steam and falling debris or hot rocks. Other villages like San Roque, Sta. Misericordia and Santo Niño became deathtraps. Ash was carried in black clouds as far as 160 kilometres (99 mi) from the catastrophic event, which killed more than 400 people. On May 7, 2013, at 8 a.m. (PST), the volcano produced a surprise phreatic eruption lasting 73 seconds. Ash, steam and rock were produced during this eruption. Ash clouds reached 500 meters above the volcano's summit and drifted west southwest. The event killed five climbers, of whom three were German, one was a Spaniard living in Germany, and one was a Filipino tour guide. Seven others were reported injured. The bodies of the hikers were soon located by the authorities. However, due to rugged and slippery terrain, the hikers' remains were slowly transferred from Camp 2 to Camp 1, the site of the rescue operations at the foot of the volcano. According to Dr. Butch Rivera of Bicol Regional Training and Teaching Hospital, the hikers died due to trauma in their bodies, and suffocation. Authorities were also able to rescue a Thai national who was unable to walk due to fatigue and had suffered a broken arm and burns on the neck and back. Despite the eruption, the Philippine Institute of Volcanology and Seismology stated that the alert level would remain at 0. No volcanic earthquake activity was detected in the 24 hours prior to the eruption, and no indication of further intensification of volcanic activity was observed. and no evacuation was being planned. On August 12, 2014, a new 30m-50m high lava dome appeared in the summit crater. This event was preceded by inflations of the volcano (measured by precise leveling, tilt data, and GPS), and increases in sulfur dioxide gas emissions. On September 14, 2014, rockfall events at the southeastern rim of the crater and heightened seismic activity caused PHIVOLCS to increase the alert level for Mayon from 2 to 3, which indicates relatively high unrest with magma at the crater, and that hazardous eruption is possible within weeks. The rockfalls and visible incandescence of the crater from molten lava and hot volcanic gas both indicated a possible incipient breaching of the growing summit lava dome. On September 15, 2014, NASA's Moderate-Resolution Imaging Spectroradiometer (MODIS) detected thermal anomalies near Mayon's summit, consistent with magma at the surface. On September 16, 2014, provincial governor Joey Salceda said that the government would begin to "fast-track the preparation to evacuate 12,000 families in the 6–8 km extended danger zone", and soldiers would enforce the no-go areas. On September 18, 2014, PHIVOLCS reported 142 VT earthquake events and 251 rockfall events. White steam plumes drifted to the south-southwest and rain clouds covered the summit. Sulfur dioxide (SO2) emission was measured at a 757 tonnes after a peak of 2,360 tonnes on September 6. Ground deformation (precise leveling and tilt meters) during the 3rd week of August 2014 recorded edifice inflation. Horses look on as Mount Mayon erupts in the early morning of January 23, 2018. On January 13, 2018, at 4:21 PM (PST), a phreatic eruption occurred that propelled a grayish steam and ash plume approximately 2500 meters high that drifted to the southwest side of the volcano. The activity lasted approximately 1 hour and 47 minutes and traces of ash fell in Barangay Anoling, Daraga, Barangays Sua, Quirangay, Tumpa, Ilawod and Salugan of Camalig and in Barangays Tandarora, Maninila, and Travesia in Guinobatan. Sulfuric odor was noted by residents of Camalig town proper. Rumbling sounds were also heard by residents of Brgy. Anoling, Daraga and rockfall events were intermittently recorded. Faint crater glow was first observed at 10:16 PM. The event prompted PHIVOLCS-DOST to raise the Alert Level of Mayon Volcano from Alert Level 1 (abnormal) to Alert Level 2 (increasing unrest). About 40,000 residents were displaced in the resulting evacuation. On January 14, 2018, Mayon Volcano's alert status was upgraded to Alert Level 3 (increased tendency towards a hazardous eruption) after 3 phreatic eruptions and 158 rockfall events were recorded. The summit crater also exhibited a bright glow signifying the growth of a new lava dome and the start of lava flows towards its slopes. On January 16, 2018, the province of Albay declared a state of calamity as lava flows reached the limits of the 6 kilometer evacuation zone. On January 22, 2018, Alert Level 4 was raised after Mayon spewed a 3 kilometer tall ash column at around 12:45 PM. Classes in all levels in private and public schools were suspended in the whole province of Albay. By evening, lava fountains were spewed from the crater with pyroclastic flows and ash plumes. Lava bombs and rockfalls could also be observed and rumbling sounds from the eruptions could be heard. The eruption type was classified as a Strombolian eruption. On January 23, 2018, Mayon spewed 300 to 500 meter lava fountains and ash plumes with a 4 to 5 hour interval. Lava bombs and rockfalls could also be observed and sounds from the volcano could be heard. Classes in all levels, both public and private were still suspended, work in some places were suspended as well. The danger zone was expanded up to 9 kilometers despite remaining at Alert Level 4 and residents from the expanded danger zone were evacuated. On January 24, 2018, column of ashes and lava fountains were spewed again with an interval of 4 to 5 hours. Fire bombs and rockfalls could also be observed and sounds from the eruptions could be heard. Classes remained suspended in some places in Albay. On January 25, 2018, column of ashes and lava fountains were spewed again. Fire bombs and rockfalls could also be observed and sounds from the eruptions could be heard. The eruptions had an interval of 3 to 5 hours. Classes still remained suspended in some places in Albay. Alert Level 4 was maintained at the volcano for the rest of January and all throughout the month of February as it remained restive. On March 6, 2018, after observing a decline in volcanic activity, PHIVOLCS-DOST downgraded the alert level back to Alert Level 3. On March 29, 2018, after observing a further decline in activity, PHIVOLCS-DOST lowered the alert level back to Alert Level 2 signifying the end of Mayon's eruptive activity and the volcano's decline to a moderate level of unrest. On December 26, 2018, Mayon caused two phereatic explosions but maintains Alert Level 2. On November 30, 2006, strong rainfall which accompanied Typhoon Durian produced lahars from the volcanic ash and boulders of the last eruption killing at least 1,266 people. The precise figure may never be known since many people were buried under the mudslides. A large portion of the village of Padang (an outer suburb of Legazpi City) was covered in mud up to the houses' roofs. Students from Aquinas University in Barangay Rawis, also in Legazpi, were among those killed as mudslides engulfed their dormitory. Central Legazpi escaped the mudslide but suffered from severe flooding and power cuts. ^ a b de Ferranti, Jonathan; Aaron Maizlish. "Philippine Mountains – 29 Mountain Summits with Prominence of 1,500 meters or greater". Retrieved January 31, 2011. ^ Mirabueno, M. H. T.; Okuno, M.; Nakamura, T.; Newhall, C. G.; Kobayashi, T. (2006). "AMS Radiocarbon Dating of Paleosols Intercalated with Tephra Layers from Mayon Volcano, Southern Luzon, Philippines: A Preliminary Report". Bulletin of the Volcanological Society of Japan. Volcanological Society of Japan. 36 (2): 23–28. ISSN 0386-118X. ... the oldest eruptive event must have taken place shortly before 20 cal kyr BP. ^ "Encyclopædia Britannica, Vol. 18, 9th Ed. ", pg. 749. Henry G. Allen & Company, New York. ^ "Protected Areas in Region 5" Archived 19 December 2013 at the Wayback Machine. Protected Areas and Wildlife Bureau. Retrieved on 2011-10-15. ^ a b England, Vaudine (December 24, 2009). "Mount Mayon: a tale of love and destruction". BBC News. Retrieved December 25, 2009. ^ "Mayon Volcano, Philippines". Philippines Department of Tourism. Volcano.und.edu. Archived from the original on October 12, 2007. Retrieved November 20, 2007. ^ a b c David, Lee (2008). "Natural Disasters", pp. 416–417. Infobase Publishing. ^ Oliphant, Vickiie (January 16, 2018). "Mayon volcano eruption update: Will the Philippines volcano erupt? Threat level RISES". Express. Retrieved November 30, 2018. ^ Ocampo, Ambeth R. (May 7, 2013). "The Mayon eruption of 1814". Inquirer Opinion. Retrieved May 7, 2013. ^ a b c "Mayon – Eruptive History". Global Volcanism Program. Retrieved on 2015-03-05. ^ Samuel Kneeland (1888). Volcanoes and earthquakes. D. Lothrop Co. p. 116. ^ "USGS". Archived from the original on July 15, 2012. Retrieved June 25, 2008. ^ "'Ominous quiet' at Mayon volcano". BBC. August 10, 2006. Retrieved May 12, 2013. ^ a b "Mayon Volcano". Philippine Institute of Volcanology and Seismology. Archived from the original on December 2, 2008. Retrieved 2009-12-14. ^ "Mayon Volcano Bulletin 10/25/2006". Archived from the original on April 20, 2008. Retrieved May 6, 2008. ^ "Mayon Volcano Advisory". Philippine Institute of Volcanology and Seismology. August 10, 2008. Retrieved December 24, 2009. ^ "Mayon in 'state of unrest,' alert level raised". ABS-CBN News. July 10, 2009. Retrieved January 1, 2010. ^ "Mayon spews ash anew". Volcano Monitor. Philippine Daily Inquirer. October 28, 2009. Archived from the original on August 7, 2011. Retrieved December 5, 2009. ^ "Mayon Volcano Advisory (November 2009)". Philippine Institute of Volcanology and Seismology. November 11, 2009. Retrieved December 11, 2009. ^ Papa, Alcuin (December 15, 2009). "6–7 km from Mayon volcano off limits to people". Philippine Daily Inquirer. Archived from the original on August 7, 2011. Retrieved December 15, 2009. ^ "Lava flows from Mayon Volcano". ABS-CBN News. December 15, 2009. Retrieved December 24, 2009. ^ "Mayon Volcano Bulletin 3". Philippine Institute of Volcanology and Seismology. December 16, 2009. Archived from the original on July 6, 2015. Retrieved November 17, 2015. ^ Associated Press (December 15, 2009). "20,000 Evacuated as Philippine Volcano Oozes Lava". Fox News. Archived from the original on October 17, 2015. Retrieved June 7, 2013. ^ "Residents flee as Philippines volcano threatens to erupt". CNN World. December 15, 2009. Retrieved December 24, 2009. ^ "Volcano Monitor – PHIVOLCS warns: Mayon to blow its top in a few weeks". Philippine Daily Inquirer. December 18, 2009. Archived from the original on August 7, 2011. Retrieved December 18, 2009. ^ "Volcano spews lava as eruption looms". CNN World. December 22, 2009. Retrieved December 24, 2009. ^ a b "Inquirer Volcano Monitor 2009-12-27". Philippine Daily Inquirer. December 27, 2009. Archived from the original on August 7, 2011. Retrieved December 27, 2009. ^ a b Papa, Alcuin & Nasol, Rey M. (January 1, 2010). "Mayon quieting down". Philippine Daily Inquirer. Archived from the original on January 3, 2010. Retrieved January 2, 2010. ^ "Mayon Volcano Bulletin 13". Philippine Institute of Volcanology and Seismology. December 26, 2009. Archived from the original on September 29, 2015. Retrieved November 17, 2015. ^ a b "Mayon Volcano Bulletin 20". Philippine Institute of Volcanology and Seismology. January 2, 2010. Archived from the original on September 29, 2015. Retrieved November 17, 2015. ^ "Mayon Volcano Bulletin 16". Philippine Institute of Volcanology and Seismology. December 29, 2009. Archived from the original on September 29, 2015. Retrieved November 17, 2015. ^ Flores, Helen (January 2, 2010). "Phivolcs may lower Mayon alert level". The Philippine Star. Archived from the original on September 9, 2012. Retrieved January 2, 2010. ^ a b Associated Press (January 2, 2010). "Philippine volcano calming; thousands head home". The Hindu. Chennai, India. Retrieved June 7, 2013. ^ "Alert level around Mayon lowered to 3". GMA News.TV. January 2, 2010. Retrieved January 2, 2010. ^ "Mayon Volcano Bulletin 31". Philippine Institute of Volcanology and Seismology. January 13, 2010. Archived from the original on September 29, 2015. Retrieved November 17, 2015. ^ MA Loterte (December 28, 2009). "PGMA visits Mayon evacuees, assures government aid". Philippine Information Agency. Retrieved December 30, 2009. ^ a b "Thrill-seeking tourists flock to Philippine volcano". Agence France-Presse. December 30, 2009. Retrieved December 30, 2009. ^ "UK, Canada to nationals: Stay away from Mayon Volcano". GMA News.TV. December 19, 2009. Retrieved January 2, 2010. ^ Zhang Xiang (December 30, 2009). "U.S. provides financial aid to Mayon Volcano evacuees". Xinhua News Agency. Archived from the original on June 9, 2011. Retrieved December 30, 2009. ^ "Authorities want 'hardheaded' Mayon tourists arrested". GMA News.TV. December 28, 2009. Retrieved December 30, 2009. ^ Dedace, Sophia Regine (December 31, 2009). "Albay govt to cut power in Mayon danger zones". GMA News.TV. Retrieved December 31, 2009. ^ a b Recuenco, Aaron B. (January 2, 2010). "Worst is over at Mayon". The Manila Bulletin. Archived from the original on June 7, 2011. ^ Rabonza, Glenn J. (January 3, 2010). "NDCC Update Sitrep No. 22 re Mayon Volcano" (PDF). National Disaster Coordinating Council. Archived from the original (PDF) on July 4, 2011. Retrieved 2010-01-03. ^ "UN-WFP sends aid for Mayon Volcano evacuees". Philippine Information Agency. December 29, 2009. Retrieved January 1, 2010. ^ "Mayon Volcano Advisory 07 May 2013 8:30 AM". Philippine Institute of Volcanology and Seismology. May 7, 2013. Retrieved May 7, 2013. ^ "Bodies of 4 Mayon volcano hikers arrive in Manila". InterAksyon.com. Archived from the original on June 18, 2013. ^ "Vulkanausbruch auf den Philippinen: Leichen deutscher Bergsteiger am Vulkan Mayon geborgen". stern.de. ^ "Philippine volcano Mount Mayon in deadly eruption". BBC News Asia. May 7, 2013. Retrieved May 7, 2013. ^ a b Aaron B. Recuenco (May 7, 2013). "Death toll at Mayon rises to five, seven injured". Manila Bulletin. Retrieved May 7, 2013. ^ "Bodies of 5 missing hikers spotted in Mayon Volcano". Interaksyon. May 8, 2013. Archived from the original on May 17, 2013. Retrieved May 8, 2013. ^ "Rescuers unable to bring down remains of 5 Mayon mountaineers". Philippines News Agency. Interaksyon. May 9, 2013. Archived from the original on June 9, 2013. Retrieved May 9, 2013. ^ "Last Thai survivor rescued from Mayon". Philippines News Agency. Interaksyon. May 8, 2013. Archived from the original on May 11, 2013. Retrieved May 9, 2013. ^ "5 dead, 7 hurt in Mayon Volcano ash eruption". The Philippine Star. May 7, 2013. Retrieved May 7, 2013. ^ May 7, 2013 (May 6, 2013). "Mayon Volcano Erupts, Spewing Rocks And Ash And Killing 5 Climbers In Philippines". Associated Press. The Huffington Post. Retrieved May 7, 2013. ^ "UK tells nationals in PHL to follow authorities' advice on Mayon". GMA News and Public Affairs. May 8, 2013. Retrieved May 9, 2013. ^ PHIVOLCS Mayon volcano bulletin of Friday, 15 August 2014 06:49 local time. Retrieved September 15, 2014. ^ PHIVOLCS Mayon volcano bulletin of Friday, 15 September 2014 14:02 local time. Retrieved September 15, 2014. ^ MODVOLC detection of MODIS band 21 thermal pixels at Mayon's summit. Retrieved 19 September 2014. ^ Reuters news article. Retrieved September 16, 2014. ^ Mayon volcano bulletin of Friday, 18 August 2014 08:00 local time. Retrieved September 18, 2014. ^ Mayon Volcano Bulletin 14 January 2018 12:30 AM. Retrieved January 14, 2017. ^ "Mayon volcano alert raised again, hazardous eruption believed imminent". NBC News. January 23, 2018. Retrieved January 24, 2018. ^ "Philippine province declares 'calamity' as volcano lava spreads". Reuters. January 16, 2018. ^ "PHIVOLCS raises alert level 4 over Mayon Volcano". CNN Philippines. January 22, 2018. ^ "WATCH: Mayon Volcano spews lava anew". ABS-CBN News. January 22, 2018. ^ "Typhoon sends red-hot boulders into villages" – CNN.com (archived from the original on 2008-01-25). ^ Maso, Saderra (1902). "Seismic and Volcanic Centers of the Philippine Archipelago", pp. 13–14. Bureau of Public Printing, Manila. ^ Nasol, Rey M. (December 27, 2009). "Mayon instruments intact despite eruption". Philippine Daily Inquirer. Archived from the original on December 27, 2009. Retrieved December 30, 2009. ^ Dedace, Sophia R. (December 30, 2009). "Mayon watch: An inside look at the Phivolcs headquarters". GMA News.TV. Retrieved December 30, 2009. Wikimedia Commons has media related to Mayon Volcano.